Now, 5 months old, 8 lb 3 oz! 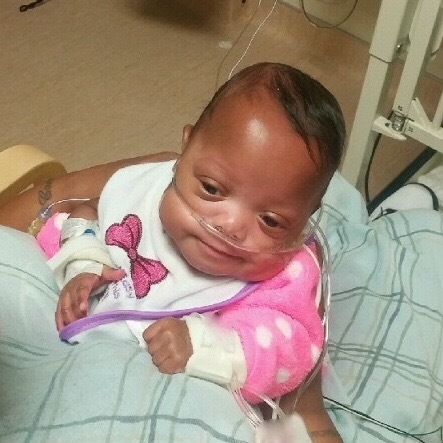 I was born at 24 weeks gestation in July weighing 1 pound 4 ounces. A week after I was born I had emergency surgery on my bowels. My doctors shared with my mom and dad that my chances of living were not good. But you can see I am a strong and determined little girl. I've had a total of three bowel surgeries and still need a bowel reconnection surgery. I am gaining weight and getting stronger each day, I now weigh 8 pounds and 3 ounces. I can't wait to go home and be with my family.